Click link for webpage or read main features below. A utilitarian portal framed design of the 1960s. Like the neighbouring Bellingham Estate, Downham was one of the cottage estates developed by the London County Council in the inter-war years. Built between 1924 and 1930 to plans by the LCC architect George Topham Forrest, it provided 7,000 new homes. 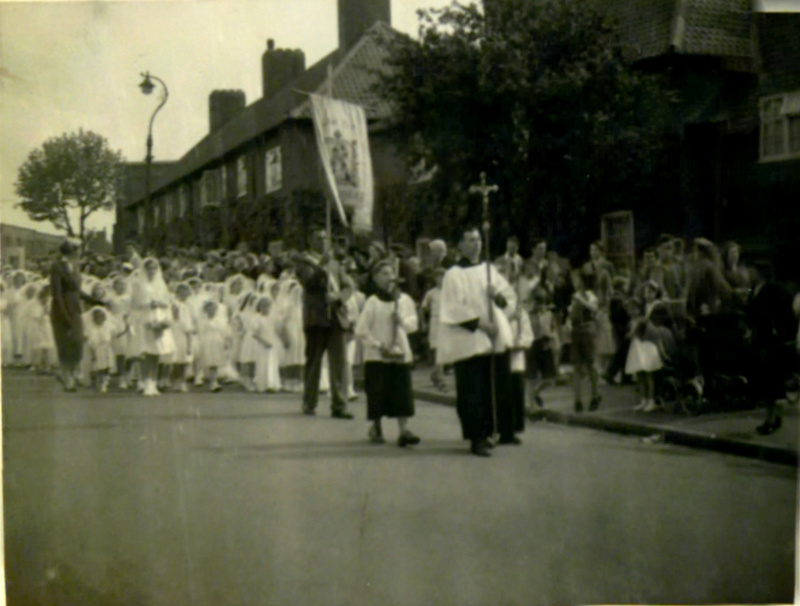 The site for the Catholic church and school was acquired for £1450 at the heart of the estate, adjoining the large park called Downham Fields. 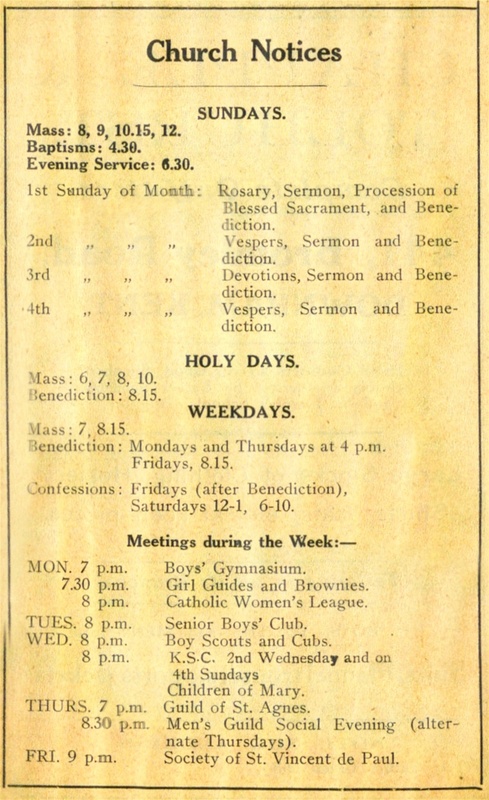 Mass was said from April 1927 at the Studio Club, by Canon William H. Monk, then financial secretary and resident at the Convent, Belmont Hill, Lewisham. 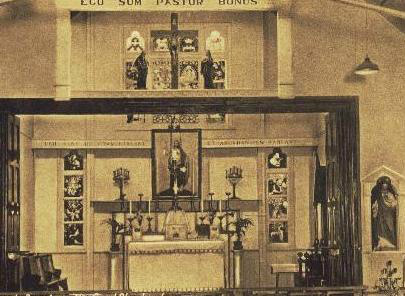 The first resident priest was Fr Joseph Simmons (from December 1928). As at Bellingham, initial efforts were directed towards the building of a primary school, while a temporary church was erected. 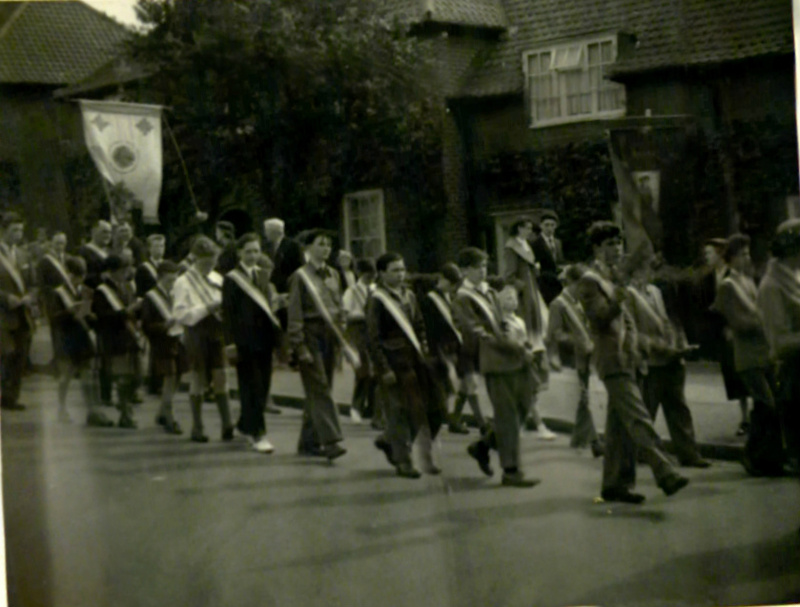 The first church on the site was a hall, erected at a cost of £1800 and used for the first time on 20 October 1929. 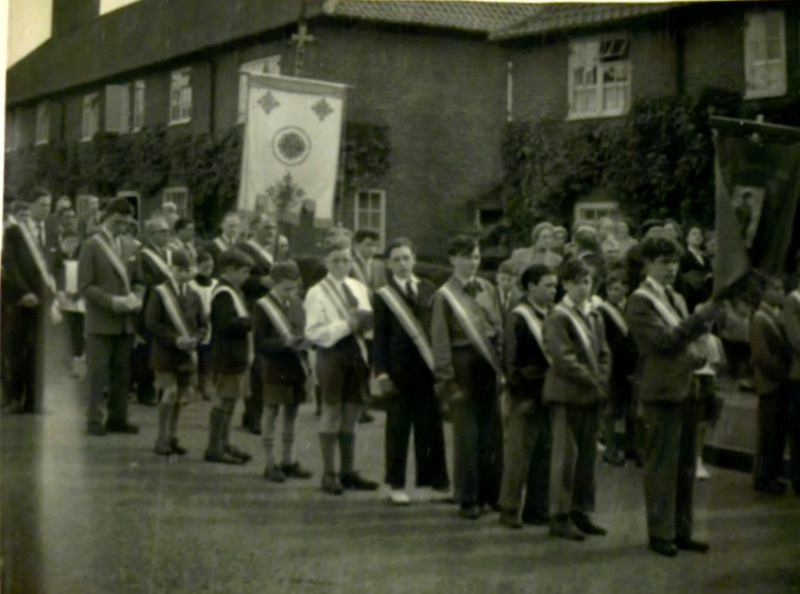 The primary school opened on 26 August 1930, and the presbytery was in use by about 1932. Two extra chapels were added to the church in 1934 and 1935. Building work for the present church started in February 1961 and the foundation stone was laid on 16 September 1961 by Bishop (later Archbishop) Cowderoy. It was largely complete by 1962 and was opened on 27 October 1963. The architect was Donald Plaskett Marshall & Partners and the builder was T. J. Nally of Connaught Construction Ltd. The cost was £40,000. Photos of a model of the church in 1961 show a 90ft-high tower beside the west front; the current brick stump at the southwest corner might be the remnant of the tower. The sanctuary was reordered in the 1970s when the original altar was moved further west and a stained glass window was installed at the east end. The window had been brought to Downham from the Convent of St Philomena at St Mary Cray, Kent. The church was dedicated on 25 November 1984 by Archbishop Bowen. The church is facing south; however, this description will follow the conventional liturgical orientation. The church is a modern and functional building, built with a reinforced concrete portal frame. In plan, it consists of a single volume nave and sanctuary, with a sacristy extension to the southeast. Originally, it appears to have had a tower to the south of the west front, which was either not fully built or radically shortened. The pitched roof has a short pinnacle above the sanctuary area. Internally, there is a narrow one-bay lobby and a nave of six bays, followed by a sanctuary of two bays. Every second bay there is a gabled clerestorey window. There is an organ loft at the west end. Furnishings include the black marble sanctuary furniture of altar, tabernacle stand, lectern and font, as well as the east window. Originally, the east wall was part glazed, part panelled in wood until the current window was installed in the 1970s. The window was designed and constructed by Hugh Powell in 1965 for the Convent of St Philomena at St Mary Cray, from where it was moved to Downham. It is made from hand-made antique glass and epoxy resin with slate powder in a technique called ‘Resglaze’, invented by Powell. The site at Grove Park was purchased by the LCC in 1920 and named Downham in honour of the chairman of the LCC. It proved a most suitable name as Downham in old English means the hamlet on the hill. Over 6000 homes were built on a site that had previously contained two farms – Shroffold farm to the east and Holloway farm to the west. Downham was described when first built as a ‘cottage Estate’. It was a low density estate with about 17 houses per acre.King George V and Queen Mary visited in 1927 to plant a tree in recognition of the LCC’s 17,000th dwelling at 165 Downham Way. Serious embarrassment was caused to the local councillors when it was discovered that the council workers had been given a half-day to honour the visit and the ceremonial spade and tree were locked in a council hut. Five sites were sold for church purposes and the first Good Shepherd Church (a temporary building),was built in 1928 and served the community until our permanent Church was built in 1961 and opened for Mass in 1963. Our community has come a long way from those river-side Londoners who were most reluctant to come and live in the country. As families settled in the area, it became a pattern for children and then grandchildren to marry and remain within the parish. This helped to create a great bond and sense of belonging among our parishioners. With the sale of council housing in the 1980’s and the huge influx of many nationalities to our area from the 1990’s, we have become a most cosmopolitan community and through our Church and our schools, we have engendered a warm welcome and a sense of belonging to so many, from so many different backgrounds. During the millennium year we discovered we had over 50 different nations represented in our parish community and that has further increased in recent years. 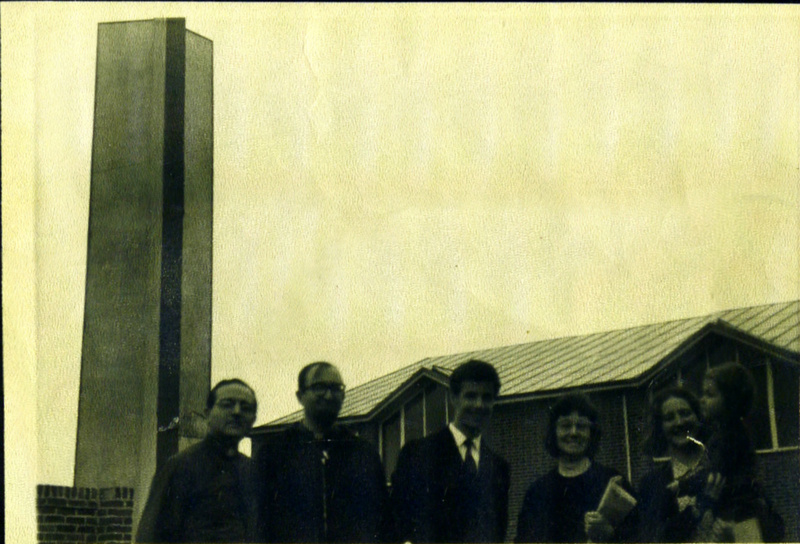 The background shows our current church which opened in 1963 with a large tower dominating the landscape. The tower had a short history and became a safety hazand in the 1970's and was reduced to the small stump which you can still see today at the edge of the carpark. This page is taken from a monthly publication edited at Campion House, Osterley. This magazine was composed of learned articles by leading Catholic writers of the day. Each subscriber received a copy of the magazine with an insert of local parish news. This kept the costs to a minimum. the monthly cost was 2p per copy or 2/- a year. 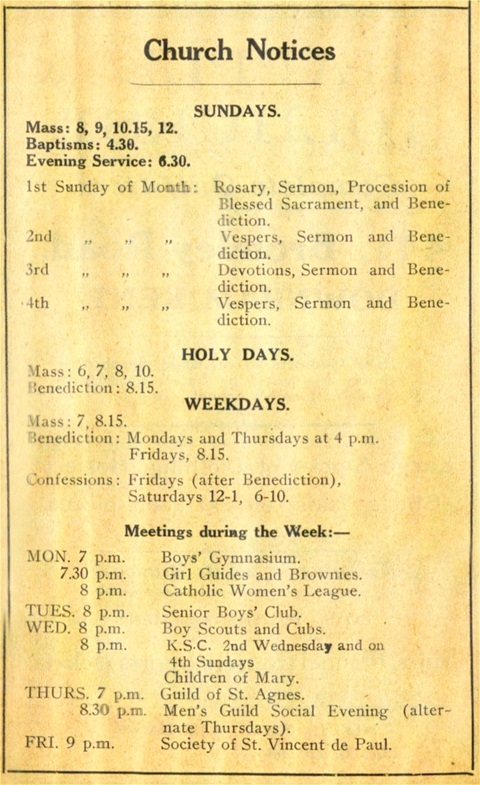 This edition was April 1934 and gives an indication of the activities in the parish at that time. 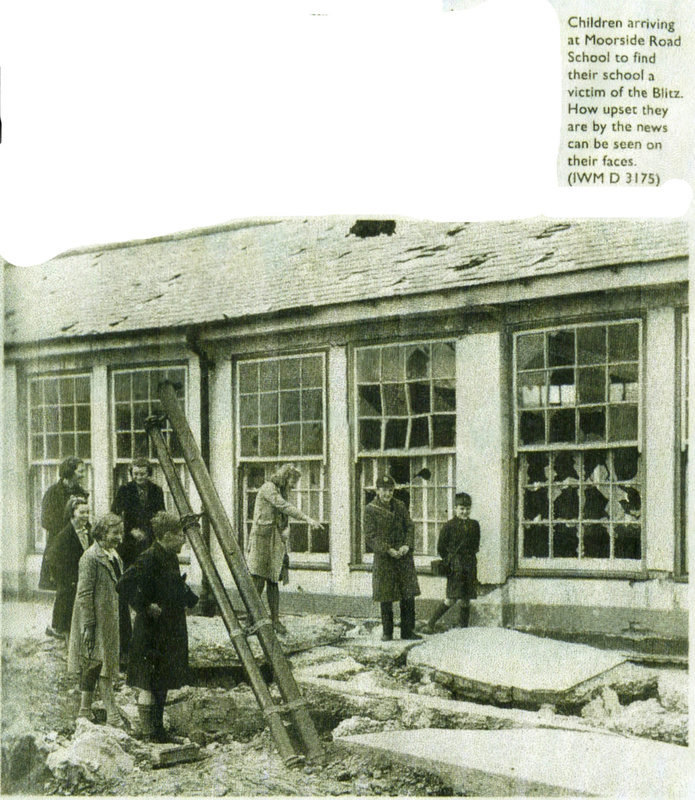 It also includes information that the debt on our newly built primary school was £9974.